Looking to take your event to the next level? 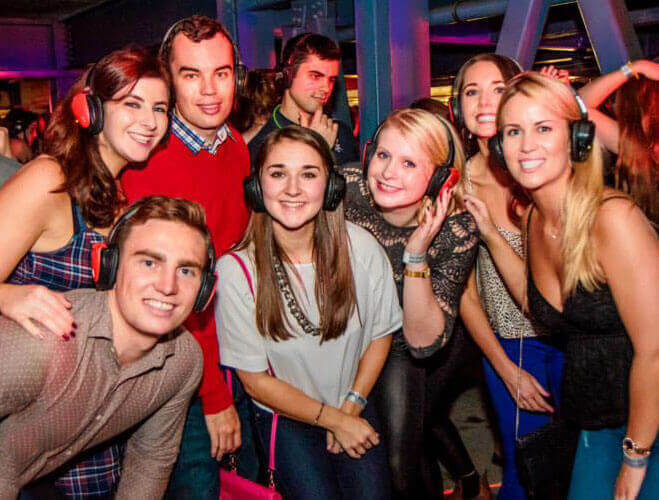 With our silent disco headphones rental packages throwing your own silent disco couldn’t be easier. We’ve been helping add a spectacle to weddings, nightclubs, birthdays, bar mitzvahs and beyond across the globe since 2007. Drop us a message today and one of our planners will be happy to guide you through the best options to give your guests a night to remember. Delivered well in advance to give you plenty of time to get comfortable with the equipment. Simply pack away the kit once you’re done and we’ll collect it. Broadcast up to 3 channels of music to the headphones simultaneously and let your guests flick between them. Perfect when catering to different age groups and music tastes. Just one of the reasons we’re the preferred wireless headphone supplier for festivals around the world. If you can hook up a DVD player you’ve got this! Equipment is checked and batteries replaced before every event so all headphones have their full 12 hours of use. No need to wait on our headphones charging, batteries can be swapped out in seconds to get them running immediately. Our tech team is on the the end of the phone at all hours to make sure things runs smoothly. All our rental packages can be customised to include extras such as lighting, decor and event staff (DJs, hosts, headphone distributors). For larger events we recommend you take a look at our ‘full show hire’ option – our full team comes to you, handles everything to your specifications, and lets you focus on enjoying your event.